Towards the end of last week, Maury Brown published the local television ratings for the league’s non-Canadian teams at Forbes. For the sport, the news is generally positive. Even as those in some quarters continue to perpetuate the narrative that “baseball is dying,” the data suggest otherwise. This isn’t to say that Major League Baseball is without its flaws, of course. Greater attention ought to be paid to some areas, particularly to the matter of local youth outreach and accessibility to the sport, in general. As a business, however, baseball is booming. In terms of general popularity, attendance and television ratings suggest that MLB is a major force. An examination of the numbers reveals a series of encouraging trends. For example, we find that (a) many viewers prefer baseball to other available options and (b) winning clubs attract larger audiences than losing ones and (c) a successful Yankees club helps ratings. Let’s take a look at some of these trends using the data from Brown’s piece, both overall and among teams. Before we begin, a note about ratings versus attendance numbers. Historically, the former respond to recent success more quickly than the latter. Team’s get a big boost after a strong season, with raised expectations for the next year. It takes some planning and expense for fans to actually attend games, though. To watch them on television, meanwhile, requires just a cable subscription and some free time. So expect these figures to be more reactive to success than similar numbers for attendance. 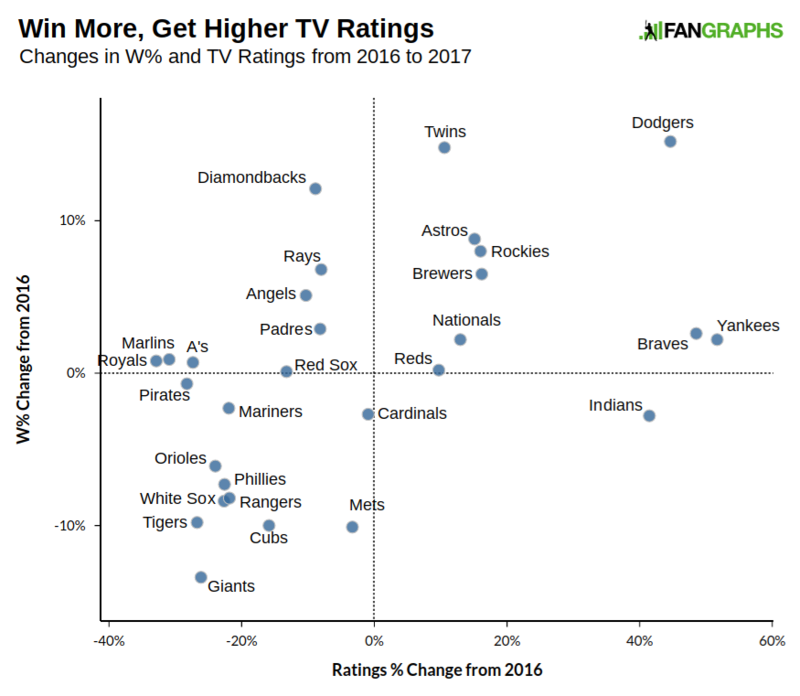 The chart below shows the change in winning percentage for MLB teams from 2016 to 2017 as well as the percentage change in local television ratings. Eight of the 12 teams to have recorded at least a 20-point improvement in win percentage from last season have seen also experienced a more or less corresponding improvement in television ratings from. Of the four teams not to have benefited from a ratings bump, only the Diamondbacks have actually been good — although the Rays and Angels are each contending for a playoff spot. At the other end, eight of the 11 teams that have seen a drop of 20 point greater in winning percentage have also seen falls in the ratings, with only the Indians — after a World Series run and a first-place team currently — experiencing a big improvement. The Royals’ numbers have declined, but that might just represent a return to normalcy after consecutive World Series appearances. A drop was probably inevitable after a rough 2016 campaign and a disappointing start this year. What this graph also reveals is that half the teams have seen at least a 10% drop from last year. In terms of overall losses, they aren’t very large when compared to last season, and are improvements over both 2014 and 2015. The graph below shows total average viewership across all teams, taken around midseason every year. The figures here more or less represent the number of people watching baseball every night in 25 of the biggest markets in country. In 2014, the Dodgers and Astros had almost no viewers due to network and carrier issues. The Dodgers still have those problems. 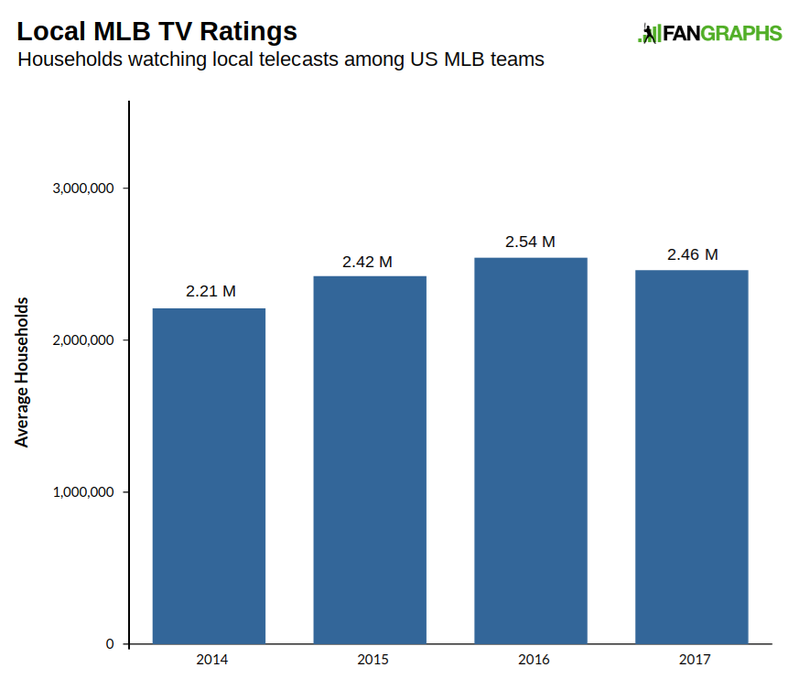 They’re on more televisions this year than they last, but if they were in as many homes as the other regional sports networks, MLB would likely have seen an increase for the third straight season. As it stands, despite a 100,000-household boost from the Yankees, we see a small drop overall. Nobody is going to throw a party for a 3% drop in viewership, but as customers continue to drop cable, keeping steady is actually a good outcome. Add in markets that don’t include an MLB club — there are another seven markets with more than 1 million households; another 30 with at least 500,000; and 154 with at least 100,000 — plus those watching on MLB.TV, ESPN, FOX, FS1, MLB Network and TBS, and there are more people making baseball part of their night than the Late Show with Stephen Colbert or the Tonight Show Starring Jimmy Fallon. In terms of competition, MLB is doing incredibly well. The chart below shows the number of MLB broadcasts beating all shows (network and cable) over the last three years. In 11 of the biggest markets in the country, more people are watching baseball than any other programming option. As audiences become more fractured, remaining steady means getting better when compared to the competition. When looking at cable programs, MLB games are doing even better. There are only 25 markets in which to be No. 1. In every single market that’s home to an MLB team, an MLB team’s games are the highest-rated cable program. The Dodgers are only in half the cable homes out in LA, and they are still the top-rated cable show. The Mets and Angels are second to the Yankees and Dodgers in their respective markets, the White Sox are third in Chicago, and only the seventh-rated Oakland A’s in the Bay area are out of the top-three locally. Everything isn’t great, however. Here’s the change in television ratings for every team from their average in 2014-2016 to this season. A few of those teams down in the negative areas aren’t that much cause for concern. 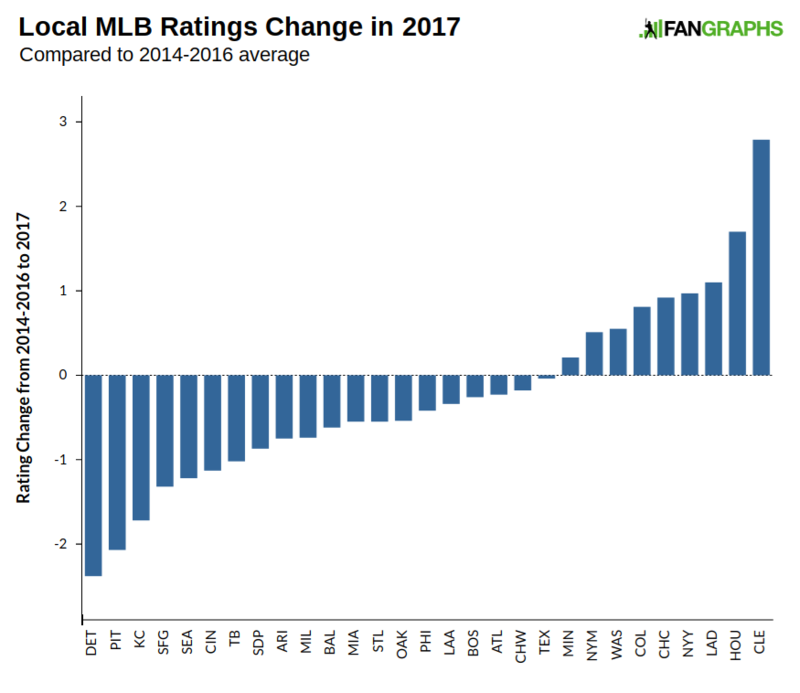 The Royals’ ratings are still very good, while the Tigers and Pirates have dropped from very good to merely good. There’s little reason to believe that competitive teams wouldn’t drive those ratings back up. The Giants’ poor season explains most of the problem in San Francisco. That many of the successes in the graph below are in the largest markets is generally a good sign for overall viewership, as those numbers will move the needle a little bit more when the corresponding teams show signs of improvement. One of the principal fears regarding the economics for MLB teams is a potential cable bubble. Continually lowering the number of cable subscribers is going to reduce both viewers and income for the regional sports networks who pay MLB teams vast sums of money to broadcast games. MLBAM is well set to adapt to whatever technological needs consumers have, but teams will have to face a difficult decision at some point if subscribers keep dropping cable and those regional sports networks have the exclusive right to broadcast games. The RSNs might be willing to keep paying teams large sums of money, but MLB teams then risk losing substantial opportunities to retain and make new fans if cable television is the only avenue to watch games. One positive development in this respect has been the skinnier streaming bundles that keep popping up. Whether it’s Sling, PlayStation Vue, Hulu, DIRECTV NOW, or YouTube TV, all of them are including RSNs as part of the smaller packages. The fear would be that, as channel providers get slimmer, regional sports networks might be vulnerable. That hasn’t been the case so far, as the newer streaming providers have placed an emphasis on sports and on local sports channels, deeming those channels part of the essential cable experience. If cable subscribers are dropping traditional cable carriers for streaming services, MLB teams appear to be well insulated for now. If ,at some point, the model switches to an exclusively a la carte model, teams will have a difficult time navigating guaranteed sums of money from an already established fan base versus selling their product more cheaply as advertising in order to promote to fans who don’t yet follow the game. We hoped you liked reading Local MLB TV Ratings Shine, Clouds Still Loom by Craig Edwards! Sorry to be that guy, but here is your first sentence: Towards the end of last week, Maury Brown published the local television ratings for the league’s 30 teams at Forbes. Merely acting in their own self-interest.